When four deer fell through the ice at a York County, Pennsylvania park last week, rescuers jumped into action right away. Pennsylvania Game Commission officers pulled the deer out of the water, as bystanders including John Stoll Jr. helped them. One animal died during the rescue, two more were quickly dragged to shore, and another was rescued after spending hours in the frigid water. Stoll decided to take that one home to nurse it back to health. He admits that he snagged the animal before game wardens arrived on his side of the lake, but says the animal would have been euthanized or left to suffer if he didn’t intervene. “I said ‘Why did we even spend the effort to get him out? '” Stoll remembered. Instead of abandoning the animal, he loaded it in his truck and took it home. 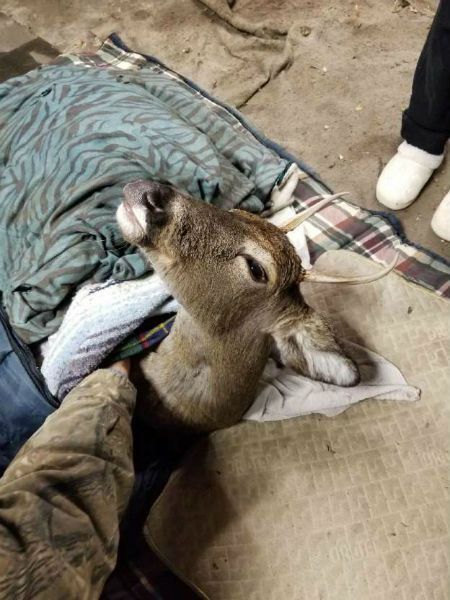 Over the weekend, he shared Facebook updates of the injured deer resting under blankets in his garage. Sadly, the animal passed away less than a day later. But despite his generous work to save the deer, Stoll was cited by the game commission for bringing the animal home. Now, Stoll says he’s facing two fines for unlawfully taking wildlife out of its habitat, one of which could cost him up to $800. The Game Commission’s press secretary, Travis Lau, wouldn’t comment on Stoll’s specific case but told The York Dispatch that “no one owns” Pennsylvania’s wildlife. “In the case of injured animals, they only ever go to licensed wildlife rehabilitators.” He added that well-meaning citizens can have a “reverse effect” on an injured animal’s well-being. “That’s just unreal,” York told the Dispatch. The animal lover says he was shocked when a game warden visited his home on Monday with the bad news. He told the local newspaper that the office’s mixed messages about caring for the animal upset him the most. “If the Game Commission had a problem with me taking the deer, why weren’t they here Saturday night looking for me,” Stoll said in a video he shared on Facebook Monday. On social media, most people sided with Stoll, saying that his good deed of caring for the injured animal – and burying it in his backyard – make up for whatever infraction he could be cited over. Stoll says he’s more upset that the deer couldn’t pull through than he is about the indignity of being fined. “I’m just really disappointed he didn’t survive,” he said. But Stoll also says the incident has convinced him not to lend a helping hand the next time. “I said I will never do nothing for the game commission ever again,” he told the warden that visited his home this week. Stoll says he plans to dispute his citation, and that an online fundraiser is already collecting money to support him. He says at least some of that money will be donated to organizations that support wildlife.